This is an interesting calculator I found on the BBC. 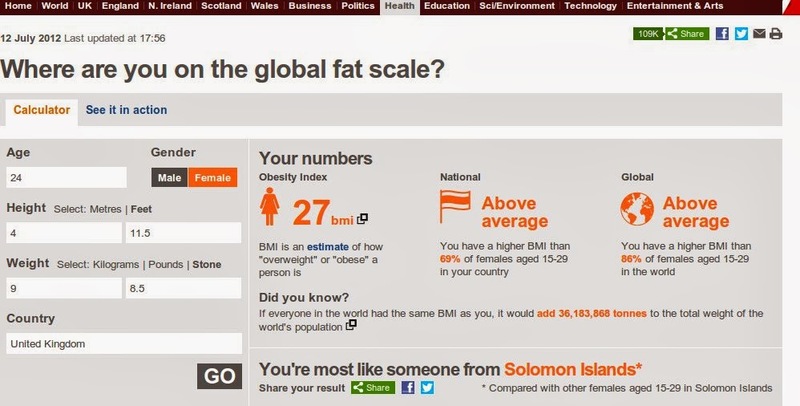 They used official UN data for over 150 countries to work out average BMI's and put it on a scale. I started as most like a Somoan, then moved down to Belarus, then Soloman Islands, then the Bahamas and now I'm back at the Solomon Islands. For me this is a fun way to measure stuff. I guess the ideal would be to be most like someone from the UK. Or even better, Latvia (they're on the average BMI line). I feel like I should add that there are many arguments and concerns regarding BMI, which I am not going into. This calculator was also created in 2012 and god knows how old the UN data is. If you are going to base your weight loss goals on this; I suggest you re-think the reasons you're on a diet.